Does your child believe in fairies? With the Disney Fairies Tinkerbell Animated Lamp from Today’s Concept, you can bring a touch of this classic tale to your child’s bedroom. The lamp features a sculpted Tinkerbell and floral design that sways with the touch of a button. Soothing music from the Disney Fairies series plays while the lamp is in motion, only adding to the charm of this piece. This lamp makes a great addition to a nursery, young child’s bedroom, or for those who are young at heart! The Disney Fairies Tinkerbell Animated Lamp also makes a great birthday or holiday gift idea. Telemania 027169 Tinkerbell Lamp at the press of a button, Tinker Bell sways and bends as Disney's fairy music plays. 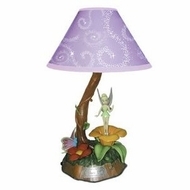 The lamp features a beautifully sculpted Tinker Bell in a flower garden.